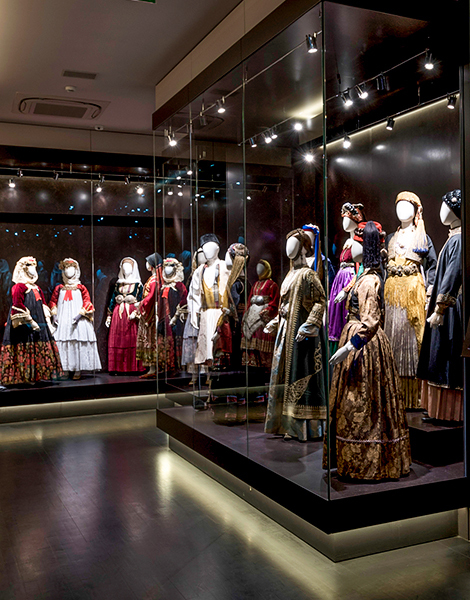 Even visitors not normally drawn to local folk costumes will be impressed by this new museum in Kalamata that is a true labor of love. 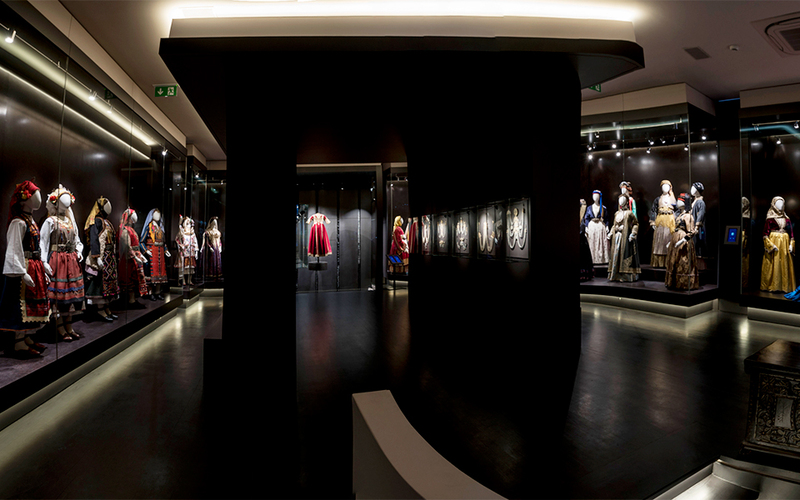 The Museum of Traditional Greek Costumes is a cultural gem born of the passion, perseverance and dedication of one woman in particular. 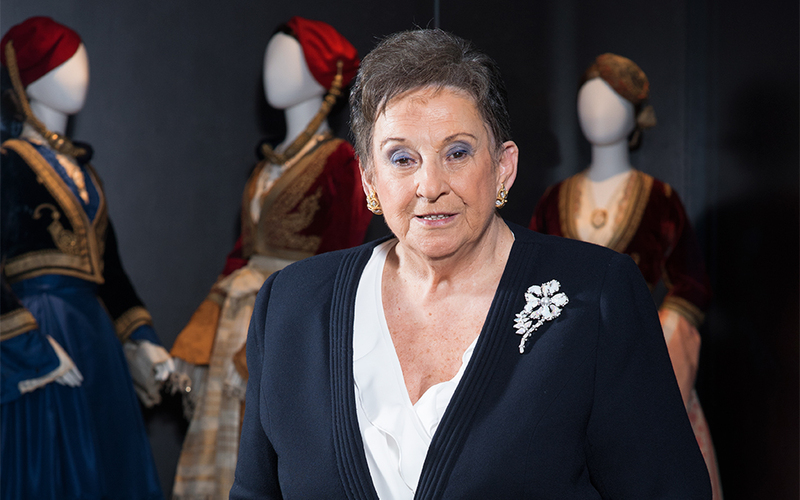 Collector and donor Victoria Karelia is the President of the Lyceum of Greek Women of Kalamata, and the museum is a result of her efforts. The costumes and their various components narrate the history of local folk dress from the mid-18th to early-20th century, combining modern stage design and an exemplary use of sound and light. The signs describing the displays have been replaced by touch screens that make the experience interactive and enjoyable. Each day, the guestbook is filled with praise from Greek and foreign visitors alike following their fascinating introduction to the cultural heritage of this region in the Peloponnese. The museum is the result of a lifelong dream for Karelia, 45 years of effort to be exact. 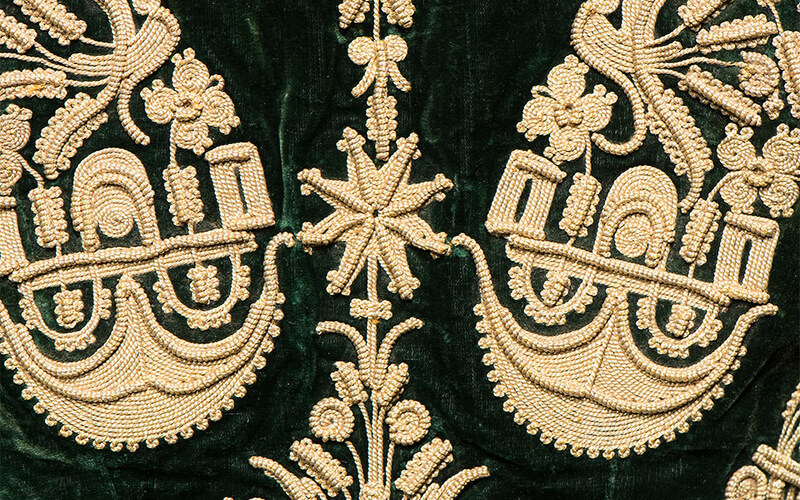 It is one of the largest folk costume collections in Greece and came about through a combination of local women who recreated each costume stitch by stitch and professional tailors who scoured towns and villages for pieces. At 64 Stadiou street, we are welcomed into a building remarkably restored by architect Thanassis Kyratsou, who has restored monuments such as the Church of Trinita dei Mondi, the Palazzo Madama and the Villa Medici in Rome. The space is abstract, devoid of any decorative element that could compete with the main attraction – the costumes themselves. Black is the color that dominates, the tall climate-controlled glass cases bring the costumes to life with subtle moving mechanisms, and the costumes and accessories glow under the exemplary lighting designed by Eleftheria Deko. The evocative soundscape created specifically for the museum by award-winning composer Dimitris Bakas further enhances the experience. On the first floor are costumes from the traditionally semi-nomadic Vlach and Sarakatsani populations. The second floor houses the tsoukna – a dress that is variant of the Byzantine dalmatica (a type of sleeved tunic). Here also are the many-pleated dresses from the coastal and island communities with commercial links with the West. The epilogue is the establishment of a more modern type of dress by Queen Amalia, and the subsequent rise in more western fashions thanks to the decisive contribution of Queen Olga. Each exhibit tells its own story and you can’t help but imagine how many meters of thread, how many sleepless nights under the light of an oil lamp, how much knowledge and passion were required for each garment’s creation. You can sense the pride with which it was worn back in its day, before being enclosed in a treasure chest, waiting to acquire a second life as a museum exhibit. Each piece was restored, identified, catalogued, classified and photographed in ultra-high resolution to create the exhibits in their present form for visitors to enjoy, a process requiring thousands of hours of hard work and incredible attention to detail. Just dressing each of the custom-made mannequins often took an entire day. Victoria Karelia proudly declares that the work was based almost exclusively on private initiatives. The day-to-day operation of the museum will be actively supported by the Foundation of Giorgos and Victoria Karelia. Plans are in motion for a gift shop, a catalogue of the collection and a website. The response has already been very positive. 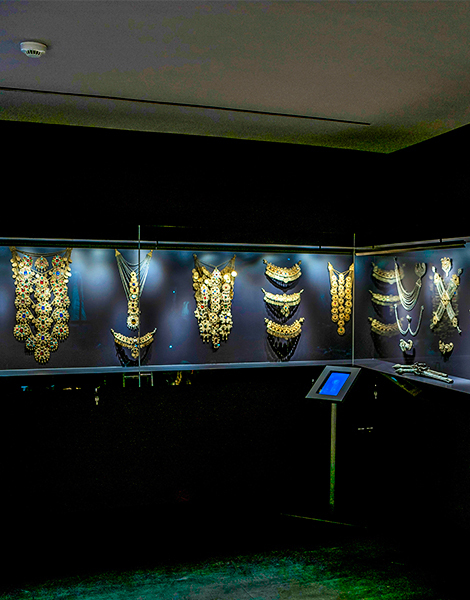 Greeks from other regions, schools from across the Peloponnese, foreign tourists and even restorers from the Victoria and Albert Museum in London have praised the collection. Returning to Athens, we stop in Nafplio to visit the silent heroine of Greek traditional costume maintenance, Vasiliki Minaiou. The costumes housed at the Peloponnesian Folklore Foundation, the Benaki Museum and the Karelia museum have all passed through her hands. 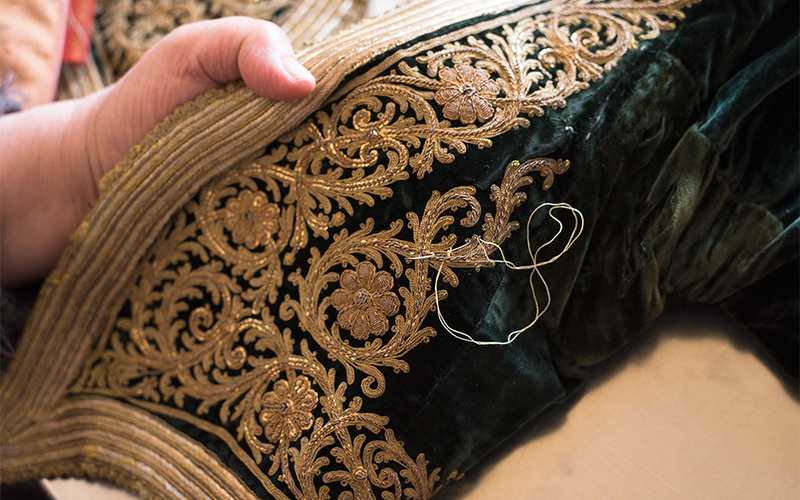 Her archive, in which hundreds of costumes and step by step repairs have been photographed, is a veritable treasure trove. Her one sadness is that members of the younger generation that visit her from time to time are not interested in apprenticing with her and carrying the torch forward. As long as her eyes and hands hold out, she continues, but the accumulated expertise she possesses is in danger of being lost when she retires. Vasiliki Minaiou trained for three years at the Victoria and Albert Museum in London, where she had sent a simple, sincere CV at the encouragement of Joanna Papantoniou, a set and costume designer and the founder and president of Peloponnesian Folklore Foundation. Mrs Minaiou is mind-bogglingly humble, stubbornly rejecting any notions of heroism regarding her work. It’s touching the way in which she unfolds each new garment across her stainless steel table, carries out the initial diagnosis – holes in the armpits, worn embroidery, faded colors – and plans surgical interventions. She matches fabric and applies it with skillful stitches. Other times the garments must be cleaned carefully with water, dried with blotting paper and left to dry for days. To liven up colors, she uses steam. The process is extremely time consuming and may require up to a month for each piece. The materials come from either Athens or abroad and are becoming increasingly scarce, especially the gold thread she uses. As for the cost, if a fully authentic costume costs up to 10-20,000 euros to buy, the maintenance can cost twice as much. She talks about the garments that have passed through her hands as if they were orphaned children – “the poor things” she says. She loves them all, and she will cares for them, for as long as she can.